Understanding the chemistry behind works of art and heritagematerials presents an opportunity to apply scientific techniques to their conservation and restoration. Manipulation of materials at the nanoscale affords greater accuracy and minimal disturbance to the original work, while efficiently combating the affects of time and environment. This book meets the growing demand for an all-encompassing handbook to instruct on the use of today's science on mankind's cultural heritage. The editors have pioneered modern techniques in art conservation over the last four decades, and have brought together expertise from across the globe. Each chapter presents the theoretical background to the topic in question, followed by practical information on its application and relevant case studies. Introductory chapters present the science behind the physical composition of art materials. Four chapters explore various cleaning techniques now, followed by four chapters describing the application of inorganic nanomaterials. Each chapter is fully referenced to the primary literature and offers suggestions for further reading. 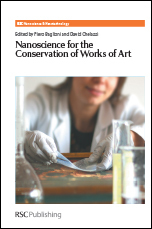 Professional conservators and scientists alike will find this essential reading, as will postgraduate students in the fields of materials and colloid science, art restoration and nanoscience.